For the 10th post of Christmas we have to thank Eagle Brand sweetened condensed milk. This is an oldie (sort of) and a very, very goodie. Perhaps a little too good. Many moons ago (about 20 years or more), Eagle had a wee liqueurs recipe fold-out book stuck on top of their can lids. I believe it was for the Christmas season, included to move more product because all used the milk. My little fold-out is stained, torn and tucked inside one of my cookbooks that are still packed away. Thank goodness I still have it, because I haven’t seen it on their cans for many years. That’s a real shame. All of the recipes sounded fantastic. I think there was four or five in total. I do remember one more. It was for a chocolate mint liqueur. I couldn’t find it with a Google search so you’ll have to believe me. It was there. I did take a look for it. Interestingly, I found a recipe for a Scotch Mist liqueur instead that uses Eagle Brand, coffee, honey and scotch. One more to try! Regardless of the consumer-based inspiration behind the booklet, it was a really good thing to do. This is by far the best homemade Irish Cream I have ever had. It never—I say never—lasts as long as you would hope. Note, it’s “Irish” Cream. That means buying Irish whisky. Regular whisky will not yield the same result. Nor will scotch. I first was introduced to this during a visit with a friend in Moncton while I was attending NSCAD. Her father had made it because they were having us for company. I try to listen to his advice, but it is hard: “It’s better the next day.” It is better the next day, marginally. I never fiddle with this recipe, but I’m torn between the optional ingredients. I usually use vanilla, but this year I used the coconut. Each yields a slightly different result. Of course you can choose to use neither. 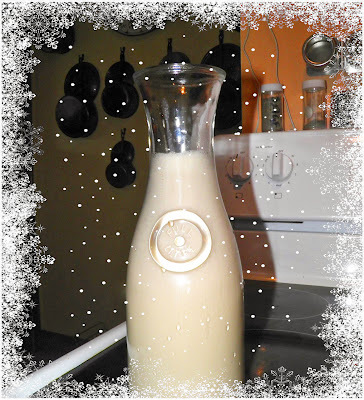 If you know someone who loves creamy liqueurs, or Irish cream in particular, you should gift this. It’s unbelievably easy to make, and will last refrigerated for one month. I can guarantee this will not be put to that particular test. A 750 ml bottle of Irish whisky will yield 3 batches if using 1 cup, or 2 batches using 1.5 cups. Go for the stronger! Keep it refrigerated until gifting, and then make sure it’s refrigerated once it reaches its final destination. Mix all ingredients together in a blender until smooth. Strain if desired. I do not. Bottle and let sit for one day before use (yeah, right…). Keep refrigerated and shake before pouring. 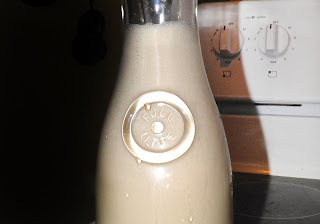 Homemade Irish Cream can be refrigerated for up to one month.